On October 15th Bishop Michael made an archpastoral visit to Holy Transfiguration Church, Pearl River NY. 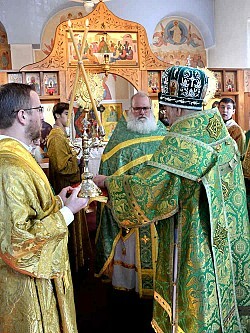 During the Hierarchical Divine Liturgy, His Grace bestowed an award of the Holy Synod of Bishops of the Orthodox Church in America -- the Jeweled Cross -- upon the rector of the parish, Very Reverend Igumen Joseph (Hoffman). Among his several remarks, Bishop Michael related the Holy Synod’s recognition of Igumen Joseph’s many years of dedicated service to the Holy Orthodox Church as a priest, his position as secretary to the former Archbishop of New York, and his active role in pan-Orthodox relations with the Russian Church Outside of Russia. Igumen Joseph is an M.Div. graduate of Saint Vladimir’s Seminary and stavrophore monk tonsured at Saint Tikhon’s Monastery (South Canaan PA). He was assigned as Rector of Holy Transfiguration Church on July 1, 2000. Prior assignments were: Dean of Holy Trinity Cathedral, Chicago IL; Rector, Christ the Saviour Church, Byesville OH; Sacristan, Holy Virgin Mary Cathedral, Los Angeles CA; and Rector, Saint Michael Church, Pueblo CO.
Several area clergy concelebrated the Liturgy: The Very Reverend Archpriests Joseph Lickwar (Diocesan Chancellor, Rector of Saint Peter and Paul Church, Jersey City NJ); Samuel Kedala (Dean of the New Jersey Deanery, Rector of Holy Spirit Church, Wantage NJ); Joseph Frawley (Orthodox Chaplain of the United States Military Academy at West Point NY); Kyril Riggs, Rector of Saint John the Baptist Church, Spring Valley NY); the Reverend Priests Igor Kysnyuk (Rector of Saints Peter and Paul Church, Bayonne NJ); Benedict Churchill, Saint Vladimir’s Seminary, Crestwood NY); the Reverend Protodeacon Dimitri Temidis (Holy Protection Church [ROCOR], Nyack NY); Subdeacons Alexander Koranda (Saint Tikhon’s Seminary); John Paschenko and Serafim Temidis (Holy Protection Church [ROCOR], Nyack NY); and Alexander Vlachos (Christ the Saviour Church, Paramus NJ). The Very Reverend Archpriest John Nehrebecki, former Dean of the New Jersey Deanery and Pastor Emeritus of Christ the Saviour Church, Paramus NJ, was also in attendance. The Holy Transfiguration Church Choir, under the very capable direction of Tatiana Tjoa, augmented with singers from The Spirit of Orthodoxy and The Holy Myrrhbearers Women’s Choir, provided traditional and glorious music and responses for the Divine Liturgy. At the conclusion of the Liturgy Tatiana Tjoa, Serge Jelenevsky and Lidia Jelenevsky were recognized by Bishop Michael for their many years of dedicated service as Orthodox Church singers. They were presented with cloisonné icon-pins of Saint Romanus “the Melodist” and certificates of appreciation. After a robust singing of “Our Father” and the blessing of the food and drink, a festive banquet in honor of Bishop Michael and Igumen Joseph was served in the parish hall by the pre-teen and teenage girls of the parish and hosted by the women of Holy Transfiguration for all the clergy, parishioners, and guests. Toasts and addresses were made by the Starosta, Boris Maltsev, and by Fathers Joseph Lickwar, Samuel Kedala and John Nehrebecki. In his address, His Grace commended the parish on their Orthodox Christian witness to the community of Pearl River NY and challenged them to continue it into the future. Additional remarks and thanks were given by Igumen Joseph highlighting the importance of the local Orthodox Christian community and its role in providing missionary outreach but, especially, mutual spiritual support to all her members. The banquet concluded with the singing of “We Give Thanks” and the archpastoral blessing of Bishop Michael.